Just Say Gnome! 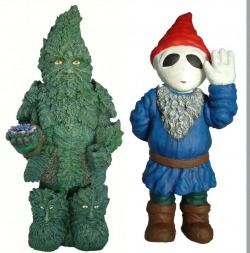 is dedicated to making politically fun and spiritually inspiring Garden Gnomes to lighten and enlighten everyone's life. Most of our quality handmade gnomes are named based on puns combining heavy political, intellectual, and metaphysical perspectives with the carefree innocence of Garden Gnomes. From Gnome Chomsky to Howard the Zinn Monk and Garden OMs we hope they'll make your Heart happier and your Garden more fun and inspirational. The KICKSTARTER For The GNOME CHOMSKY THE GARDEN NOAM COLORING BOOK is Just About to Begin! Currently scheduled to run from April 18th to May 23, 2019. Here's a link to the preview if you want to get a look a little ahead of time! * I think that it's probably a bit of a weird book for either a coloring book or a book about gnomes - or Professor Chomsky for that matter - but hopefully it will fit into a meaningful and useful all new genre of its own. Because of both the irregular production schedule and the varying prices of shipping an automated system for ordering is still not available. But if you are interested in a Garden Noam please contact me via the 'Contact Us' page and I'll respond as soon as I can manage to. Thanks for your understanding! The basic prices for the Gnome Chomsky's range from $96 to $238 depending primarily upon whether or not they're painted as well as which size version you are interested in. They're of course a bit more expensive than most garden gnomes available at Walmart or similar stores as they're cast in solid cement and handmade domestically. Painted Noams are considerably more expensive as I'm committed to carefully and precisely painting each one. Shipping is additional and ranges from around $17 to $50 domestically and generally costs $60 or more for international orders. I hope this info helps. 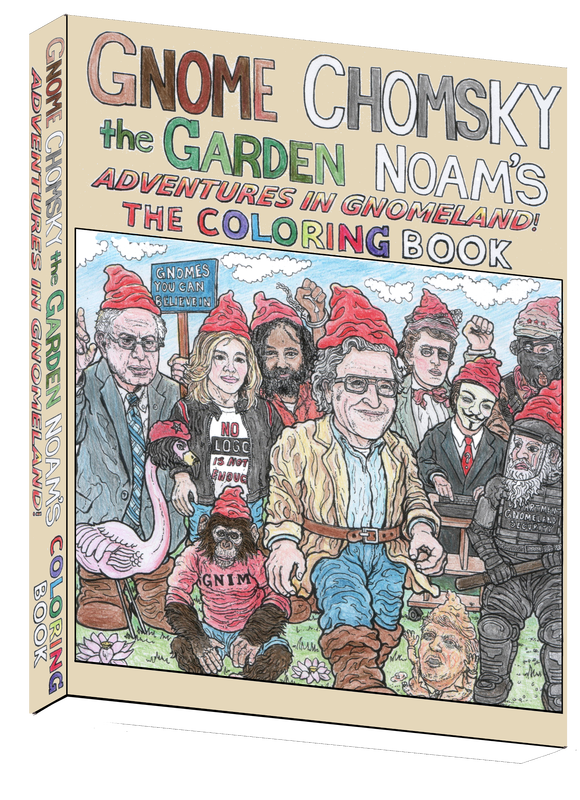 Also relevant in regards to the pricing of the Garden Noam Chomkys: I'm currently doing a little fun and informative (coloring) Book about Gnome Chomsky's adventures visiting other left-wing gnome intellectuals and activists such as Garden Gnaomi Klein, Emma Goldgnome, Gnomia Abu Jamal, Amy Goodgnome and many others. I'm looking forward to offering this as a much lower-cost alternative to the physical Noam-gnome figures. A couple T-Shirts featuring Garden Noam and friends are also in the works. These items will be in the $10 to $30 price range and shipping shouldn't cost much more than a few dollars in most cases - and I'm be doing a crowdfunding campaign via Kickstarter to make the initial publishing of the book possible. But I do plan to quite substantially raise prices for the cement Garden Noams after the book and shirts of him become available - as I'm aiming to minimize and eventually phase out their production since I'm focused on other projects and don't really have good manufacturing facilities for them any longer. Howard the Zinn Monk goes for $70 unpainted and $165 painted and generally costs in the middle range of the Noam shipping costs. The molds for both the 'Garden Om' gnomes and Greenman gnomes are in somewhat worn condition so I can only currently offer slightly imperfect versions of these gnomes. But because of their imperfections they're being offered at a slightly discounted price - such as down from $26 to $23 in the case of the Garden Oms. NOAM CHOMSKY THE GARDEN NOAM™ VERSIONS I & II Larger (version I) - painted: $238, unpainted: $108 Shorter (version II) - painted: $228, unpainted: $96 * Click image for details. - - - - - - - - - - - HOWARD THE ZINN MONK™ - - - - - - - - - - - $70 - Unpainted, - $165 - Painted * click image for more info. the Three varieties of "OM" - Male 'Yoga-Style' & ' Zen-Style' and Female 'Yoga Style' Om Gnome. - - - - Om's are not currently regularly available and generally have little imperfections when available. - - - - price ranges between $22 to $26 + shipping.